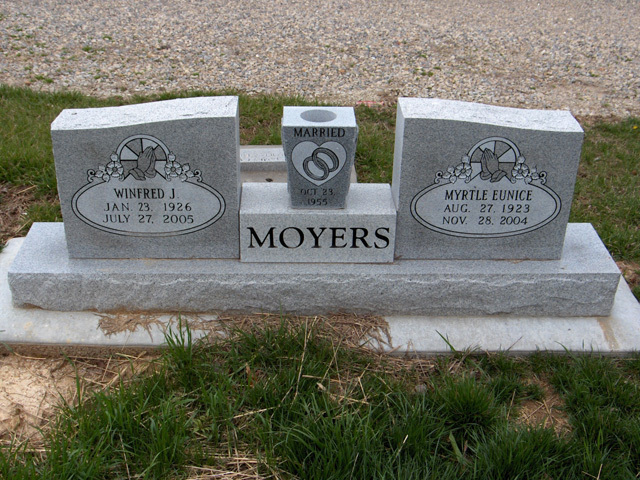 Winfred Junior Moyers, age 79, of Glen Allen, MO, passed away July 27, 2005 at his residence. He was born January 23, 1926 in Hiram, MO, son of K. W. and Dorothy Drum Moyers. He and Eunice Nixon were married on October 23, 1955 and she preceded him in death on November 28, 2004. He was a plant manager for the West Lake Quarry, and a member of the Turkey Creek General Baptist Church. He served his country proudly in the Army Reserves from 1950-1956. Survivors include; two brothers Harold Moyers, Hiram, MO, Clyde Moyers, Bells, TN, and two sisters Pearl Durham, Marble Hill, Betty Minson, Glen Allen, MO. He was preceded in death by his parents, one brother Bob and one sister Novella Berry. Friends may call at the Liley Funeral Home in Marble Hill from 4:00 � 8:00 PM Friday, July 29, 2005. Funeral service will be Saturday at 10:00 AM at the Funeral Home with the Rev. Loyd Ray Green and Rev. Gerald Huff officiating. Graveside services will follow at the Bollinger County Memorial Park Cemetery Chapel of Memories Pavilion.